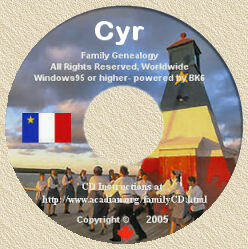 Acadian Genealogy Homepage; Acadian "Place" Names Summary ! Names of Localities & Geographical Points; "Place" names... Then and Now! Listing of towns and cities in Acadia, giving the former names along with the present-day names. *** Re. Cheticamp/La Chadye; Denise Aucoin wrote on May 25, 2004 and stated..."My understanding of the situation, is that the mouth of the now known Cheticamp harbour, was known as Le Petit Chady and another nearby area was known as le Grand Chady." Click on the button above, to View more Acadian-Cajun "Place Names"